Currier & Cameron; Shields Carriage Co. The founder of the Walker Body Co., George T. Walker Sr., emigrated to the United States from his native Scotland in 1870. After arriving in the carriage-making center of Amesbury, Massachusetts, he formed a partnership with John H. Shiels in 1885. The new firm, called the Walker & Shiels Carriage Works didn’t last for long, as the two men became partners in the well-known Amesbury carriage works of Hume & Co. The foundation of this firm dates from the purchase in 1857 by James Hume, of the business of J. R. Huntington, one of Amesbury’s oldest builders. Under the senior Hume's management the firm became known all over the country for the style and variety of its work. Hume’s eldest son, John, eventually took over the firm and when he retired in 1884, his brother, William H. Hume, assumed control, taking in Shiels and Walker as partners a year later. An 1888 a fire destroyed nineteen carriage plants in Amesbury, including three buildings used by Hume. Shiels left the firm in 1887 to form his own carriage-building concern, John H. Shiels and Co. In April of 1898, the Stanley Motor Carriage Co. of Newton, Massachusetts, commissioned the Currier Cameron Co. to build ten bodies for its new steam-operated automobile. Currier & Cameron built the bodies and subcontracted the trimming to the Shields Carriage Co., the successor to John H. Shiels and Co. From 1898 until 1900, Shields and Currier & Cameron were the only Amesbury firms involved in the automobile business. In 1898, George T. Walker Sr. left Hume to organize his own firm, the Walker Carriage Company. Walker conducted business in Amesbury until 1903 when he moved to the neighboring town of Merrimac (formerly West Amesbury). However, Hume did not fade into obscurity. In 1909 they moved to Boston, opening a shop in the middle of Boston’s automobile row, which was located on Commonwealth Ave. near Fenway Park. 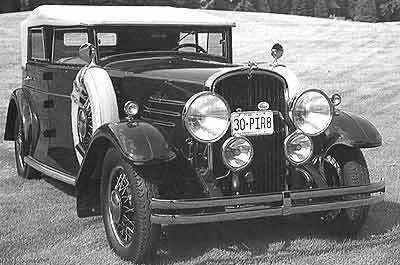 Between 1909 and 1925, they built custom bodies for Boston’s luxury car distributors, eventually being purchased by Marmon in 1924, in order to obtain the services of their president and stylist, W. E. Pierce. Back in Merrimac, Walker’s business prospered and his sons, George Jr. and James H. Walker joined him in the family business. James, his eldest son, served a term in the Massachusetts State Senate from 1905-1906, and was thereafter known as “Senator Jim”. Although Walker was a production body builder, they occasionally ventured into the bespoke field, albeit for members of the Walker family or for local municipalities. Senator Jim Walker was seen driving a custom-bodied Franklin from time to time, and Walker Carriage Co. is known to have built at least one ambulance on a 1912 Buick chassis. Walker produced bodies for a number of automakers; Abbott-Detroit, Buick, Holmes, Jordan, Lexington, Packard, Paige, Reo, Studebaker, White and Winton, but they’re closely associated with the H.H. Franklin Mfg. Co. of Syracuse, New York. 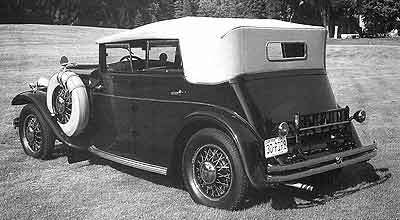 From 1910 through 1932, Walker produced bodies for the air-cooled automaker, and for most of those years Franklin was Walker’s largest customer and Walker Franklin's principal supplier of coachwork. In 1909, Senator Jim re-established the Walker name in Amesbury, forming the Walker & Wells Carriage Co. with a partner, Harlan P. Wells in a three story brick factory located at the corner of Elm and Clark Streets, the same building which later housed the Pettingell Machine Co. Business prospered and by 1911 the firm employed 150 hands. The partners incorporated in 1911 as the Walker-Wells Body Co., and bought the vacant Railroad Ave. plant that once housed the Folger & Drummond Carriage Works three years later. Over 300 craftsmen worked in the new plant, but by the end of the decade, the two existing Walker-Wells were running at maximum capacity, thanks to the increase in sales enjoyed by their major customer, the H.H Franklin Mfg. Co. of Syracuse, New York. From 1911 to 1912 Walker-Wells produced mostly roadster and touring car bodies. However, they soon discovered that closed bodies were increasing in popularity, and starting in 1913, began to concentrate on sedans and other closed body styles. Between 1914 and 1919, Walker-Wells averaged about 25 bodies per day, 50% of which were destined for the H.H. Franklin Co. of Syracuse, N.Y. The remaining orders were divided up among the following manufacturers; Buick, Paige, Holmes, Jackson, Jordan, Lexington, Packard, Reo and White. Although he remained in Merrimac, George T. Walker Sr. remained one of the Amesbury firm’s four partners, with Harlan Wells, president; James H. Walker, treasurer and Henry Miller, secretary. When Harlan P. Wells retired in 1918, the two firms were reorganized as the Walker Body Co., with two plants in Amesbury and one in Merrimac. It was decided to concentrate the firm’s efforts in Amesbury, although the Merrimac plant housed Walkers trimming/upholstery and finishing departments in the late 1920s when the Amesbury plants were running at full capacity. George T. Walker Sr. passed away in 1919, but his two sons remained in control of the firm. George T. Walker, Jr., was president; George F. Wilde, vice president; Frank M. Prescott, secretary and James H. Walker, treasurer. George T. Thompson served as Walker’s purchasing agent while G. Howard ­Temple was superintendent of production. In 1919 Walker Body Co. built a new factory on Oak St to house the entire wood-working and body framing departments. At its peak, the Oak St. factory employed 500 hands; 200 preparing the wood in the lumber yard, kiln and milling departments, and 300 assembling those pieces in the body framing division. With the Merrimac plant now closed, the former Clark Carriage Co factory was purchased in 1920, in order to provide additional space for Walker’s painting, trimming and finishing departments. Another Walker plant on Oakland Street housed the 120 employees who made the firm’s metal products. Walker made all their own door locks, forgings, molding and sheet-metal stampings, and supplied many of Amesbury’s other body builders as well. The 5 Walker plants were widely separated, and to an extent each was a self sustaining unit, so that if one were destroyed by fire, the others could continue without interruption. From 1920 through 1932, the firm’s only customer would be Franklin, and their only product, closed bodies. During the following decade, Walker became Amesbury’s second largest builder, producing from 8-10,000 bodies at its peak. According to former employees, Walker employed 1500 hands in 1926-27, its peak years, and consumed over two million board feet of white ash lumber. During this period, Walker produced an average of 75 aluminum-clad bodies per day, making them the nation's largest consumer of sheet aluminum. Although Walker had a small body engineering staff, the vast majority of the bodies they produced were designed by Franklin. Specifically, Franklin’s Series 9 and 10 bodies were designed by body engineers William H. Emond and Harry Strong, both Franklin employees. The more pleasing Series 11 and 12 were designed by independent designer J. Frank deCausse, with input from the head of Franklin’s Custom Body Dept., K.C. Haven, and its salesman, M.K. Ledyard. Emond and Strong made periodic trips to Amesbury to check on the progress of new body styles and to ensure that Walker’s quality control was in keeping with H.H. Franklin’s stringent standards. Like many production body builders, Walker shipped most of its bodies “in the white” to Franklin using closed rail cars. (In the white refers to bodies delivered to a chassis manufacturer minus trim, paint, varnish and hardware.) Once in Syracuse, the bodies would be painted and trimmed by Franklin based on the instructions received with a customer's order. However a few custom jobs were trimmed and finished in Walker's old Merrimac plant, and there were additional facilities in Amesbury as well. In the summer of 1923 a group of Franklin dealers led by Ralph Hamlin, their California distributor, issued an ultimatum that the unusual horse-collar style grill front had to go. Hamlin commissioned the Walter M. Murphy Co. in Pasadena to come up with an alternative, while H.H. Franklin solicited a competing design from independent designer, J. Frank deCausse. H.H. Franklin selected the deCausse design over Murphy's which resulted in the March, 1925 debut of the Franklin Series 11. John Wilkinson, the designer of the Franklin air-cooled engine and Franklin's chief engineer, was opposed to the redesign and left the firm in protest soon after. One of the most stunning of the deCausse Series 11 Franklins was a long, low and racy boat tail speedster introduced in 1926 called the Model 11A Sport Runabout. The lines of the 1929 Franklin 130 Convertible Coupe were downright breathtaking as well. Released after his death, Franklin credited DeCausse with designing the aluminum body, but Ray Dietrich had supervised it construction and final design. While in Europe during the fall 1926 Salons, It was discovered that deCausse had throat cancer, and his larnyx was removed in by a Paris surgeon. He was now forced to speak using a hole in his throat, which left him very susceptible to pneumonia. Unfortunately the cancer eventually spread to his lungs and he returned to the United States in 1927 to stay with his mother. While on a return trip to visit his surgeons in Paris, he developed pneumonia, and died a month later on May 10th of 1928 at the age of 48. When deCausse first fell ill, Franklin hired Ray Dietrich to continue his fine work and to initiate a custom coachwork program. Dietrich's sensational 1928 "el Pirate" is acknowledged as the first streamlined American body design, and Franklin incorporated many of it's features in their 1930 line-up - which included the very collectible custom-bodied Franklin Pirates and Deauvilles, both built by Walker. “In the Dietrich stand there will be eight bodies, embracing both formal and sport types. On Franklin chassis three bodies will be mounted. One of these is a formal town car of good lines, having two unusual features, the mounting of coach lamps at the rear quarters and the carrying forward of the belt panel across the fore door where it flows into a cowl molding swept into the base of the body, after the manner of a coupe pillar. Another interesting Franklin job is the Deauville sedan with high body sides and a striking molding treatment in which the cowl molding after following the line of the windshield pillar is swept aft into the base molding; the coach lamps on the rear quarters and the use of horizontal louvers arranged en echelon suggest derivation from the Pirate model of a year ago. The other Franklin body is a convertible sedan with the angle of the slanting windshield com­plemented by the angle of the rear-door window. “Town Car by Dietrich on Franklin chassis. This has a transformable front, the canopy folding into a compartment over the division. Coach-type lamps are positioned on the rear quarter. The car is finished in two shades of gray and the wire wheels are painted a third shade. The rear com­partment is trimmed in a Wiese modern­istic broadcloth, piped with "gunmetal" leather. “Raymond H. Dietrich has designed for Franklin two bodies of new and refreshing lines, with respect to contour and molding treatment. They have the new sloping, visorless front with rounded header, and a well rounded roof and back. The sedan has a swept rear harmonizing with the fender line, while the coupe has a specially designed trunk supplementing the contour of the body. Besides the unusual contours, the molding treatment departs from the conventional by omitting the customary through molding widened at the belt. Instead, the bonnet molding is swept up the windshield pillar, continues unbroken over the windows, down to the belt at the rear quarter and then encircles the back of the body. Replacing the customary widened belt is a simple half-round molding on the door, just above the door handle; on the sedan this molding extends across the center pillar, and on both jobs the molding ends a few inches short of joining the other molding at either the front or rear quarter. This sedan was built by Walker and is displayed in the Walker stand. The Franklin sedan exhibited by Raymond H. Dietrich is known as the "Tandem" sedan. It is a 4-door sport body with V -type sloping windshield and an angular rear, showing some characteristics of the old Brewster broughams. The front-door pillars follow the slope of the windshield, but are swept rearward at the bottom. The interior is trimmed with a Wiese tan doeskin and a harmonizing glove-finish leather. “A Victoria coupe designed by Raymond H. Dietrich and executed by Walker on the Franklin series 15 chassis. It has the modish sloping front and rounded front header, the curved motif being repeated at the back and on the special trunk. 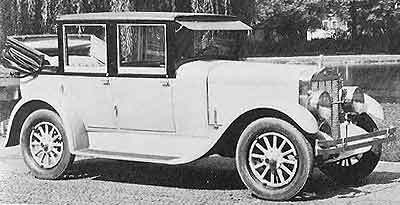 “The Franklin ‘Tandem’ sedan, designed by Raymond H. Dietrich and built by Walker Body Co., was noteworthy not only for its square back and undercut door, but also for the narrow pillars and flush side. The use of the new Campbell concealed hinge permitted a center pillar of minimum width. Years later, Dietrich recalled: "Construction used by Walker followed methods practiced by the finest custom builders. When designing for Franklin, I was always sure the construction - and workmanship - would meet the same high standards established by the custom coach builders." Walker did not build all of Franklin’s production bodies. In fact thousands of them were built by two New York State production body builders, Buffalo’s American Body Co. (1919-1925) and Watertown’s H.H. Babcock Co. (1921-28). The first bodies (1902-1903) were constructed by John Leggett, a Syracuse carriage maker, and Locke & Co. of Rochester built a small series of dual-cowl phaetons between 1929 and 1931. The Bela Body Co. and its successor, the R.H. Long Co. in Framingham, Massachusetts built bodies from 1918-1923, and Bender Body Co. of Cleveland, Ohio is known to have supplied bodies to Franklin in 1921. Between 1904-1905 and 1920-24 Franklin made some of their own bodies in Syracuse, and when Walker halted its body building activities in 1931, some of its skilled craftsmen moved to Syracuse where they built the 1932-1934 Series 17 and 19 bodies inside the Franklin plant. The bodies for Franklin’s Olympic series which were shared by the Reo Flying Cloud were built by the Hayes Mfg. Co., a large Detroit production body builder. In the first full year of the Depression, sales of Franklins had nose-dived, and due to Walker's East-Coast location, the chances of getting work from Detroit’s automakers was unlikely. Even if they had invested in the new deep-draw steel-stamping equipment that was now commonplace in their competitor’s factories, the high cost involved in transporting finished bodies halfway across the country would have made Walker’s products too expensive, especially in an era when the prices of new automobiles were falling. By the end of 1931, conditions were so bad that Walker decided to discontinue its body building business, and ventured into other fields. Amesbury’s other production body builder, Biddle & Smart, went out of business a year earlier, for many of the same reasons. The firm’s first few ventures, such as the Stanley patent Quick demountable wheel and a short-lived venture into manufacturing refrigeration equipment, proved unsuccessful. When Franklin faltered in 1933, Walker purchased a controlling interest in the Marks-Doman Engine Company, a firm founded in Syracuse by former Franklin engineers Carl Doman and Ed Marks, to market an air-cooled engine to the aero and automotive industry. Marks-Doman moved to Amesbury later that year and was headquartered in the first two floors of Walker’s No. 4 body plant. However, the rest of the Walker Body Co. was in trouble, and the firm’s trustees; Edward Gould, Clifford Carter and George Howard Temple voted to voluntarily liquidate its assets in 1934. Walker attempted to sell Doman-Marks in September of 1935 to a stillborn syndicate formed to produce another Franklin car, but the deal fell through. They managed to sell it a year later to Norman Woolworth, a relative of F.W. Woolworth, the dime-store millionaire. The 1936 sale of Doman-Marks completed the liquidation, and the firm quietly faded away. However Doman-Marks did not. With Woolworth’s backing, Doman-Marks purchased their old employer, Franklin in 1937, renaming the combined firm, Aircooled Motors Corp. The new firm manufactured engines for both prototypes - 1937 Airmobile - and commercial vehicles – White’s White Horse delivery van. With WWII steadily approaching, the firm produced 6- and 8-cylinder aero engines for WWII aircraft and post-WWII helicopters, and it was one of these engines that ended up in the 1948 Tucker automobile. In fact, Tucker bought the firm, which survived through bankruptcy proceedings through 1975 when it was bought by the Polish Government.